Published: 02:44 Monday - March 13, 2017 Trang An complex is a World Natural Heritage site and includes Tam Coc-Bich Dong - a series of karst caves and mountain pagodas, the ancient and new Bai Dinh pagodas, and the Hoa Lu ancient capital. 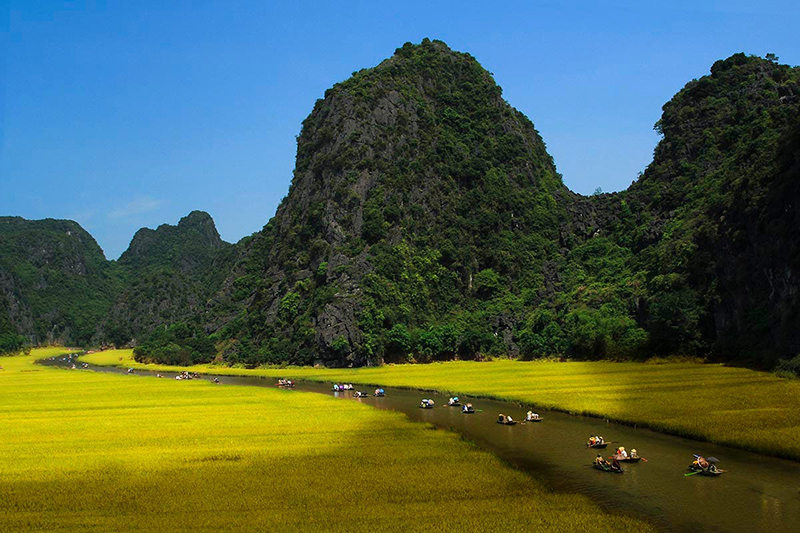 I had heard that the Trang An complex was one of most attractive natural beauty sites in Viet Nam, but my recent trip there surpassed all expectations. When we arrived at the site, about 95 kms south of Ha Noi, we took a boat to Suoi Tien Temple. The boatwoman, named Nguyen Thi Thuc, told us that usually each boat only carries five people but when there are many travellers she has to row six. Some of us were so afraid the boat might sink under our collective weight, but Thuc reassured us: "Don’t worry. I have been doing this for 20 years without an accident.” Even so, she handed out orange life vests. The river ride to Suoi Tien Temple takes an hour. I was impressed by the pure water of Sao Khe River and absence of garbage, giving us a clear view of the fish swimming alongside us and the bottom of the river. We then rowed through the Nam and Vang caves, and Thuc told us to bend low so as to evoid the overhanging stalactities. 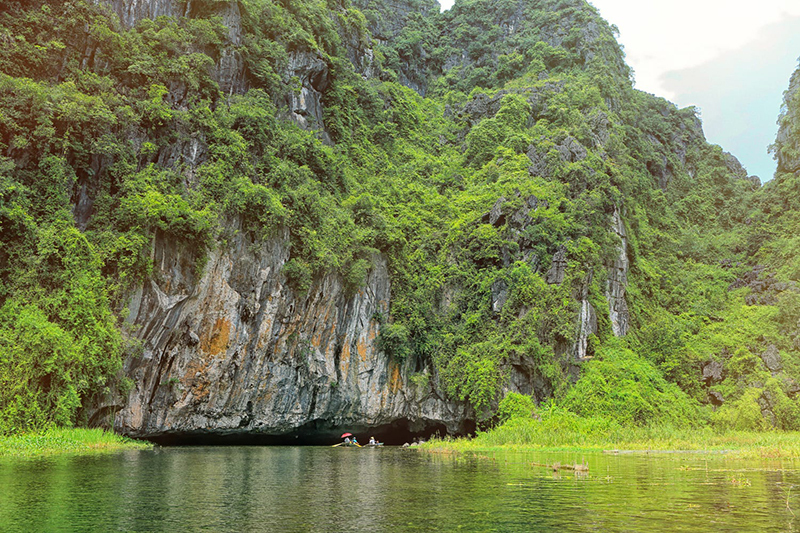 The caves were so beautiful that we asked Thuc to row slowly so that we could enjoy them. But the most impressive was the 250m Thanh Truot Cave. Asked about the name of the cave, Thuc related its story: Hundreds of years ago, King Dinh Tien Hoang passed by the cave and suddenly fell. His guards were very worried, but he recovered. The locals named the cave Thanh Truot, meaning "King’s Fall". Passing through the cave we experienced darkness, outlines of stalactities, stones growing from the bottom of the cave. The cool air was heavenly. The "decor" inside the caves was complemented by the natural beauty of the lime mountains surrounding the river. 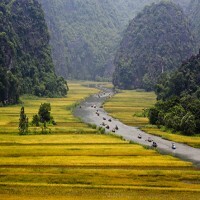 Thuc said there are hundreds of valuable herb trees and plants growing in these mountains. Her father often goes there to pick different kinds of herbs to treat ailments such as cough, cold, pains in elderly people’s legs and backs. I asked her about the name of the herbs and she promised to provide them via email. Thuc also explained why the river water was so clear: each rower is personally responsible for ensuring that no waste is thrown out of the boat and are punished or fined if their passengers disobey the instruction. I was very impressed that workers like Thuc are responsible for protecting the environment. After an hour, we arrived at the Suoi Tien Temple built in the Dinh Dynasty (924-997) to worship Thanh Quy Minh Dai Vuong, locally known as Thanh (Saint) Cao Son. Legend has it said that Saint Cao Son was a water nymph dedicated to protecting and bringing peace to the ancient capital Nam Son, now the city of Hoa Lu, during the reign of the 18th Hung King. When he died, a temple was built to worship him. But the main temple was built by King Dinh Tien Hoang in the 10th century at the Trang An complex of Hoa Lu, the ancient capital. His temple was upgraded by King Tran Thai Tong in the 13th century. Thuc said a big festival to commemorate the saint is held on the 18th of the third lunar month every year, attended by thousands of pilgrims. Tong Quang Thinh, deputy chairman of Ninh Binh Province, said the festival aims to educate young people about patriotism and protection. “This is a great occasion to wish for national stability and lucrative harvests and prosperity," he said. 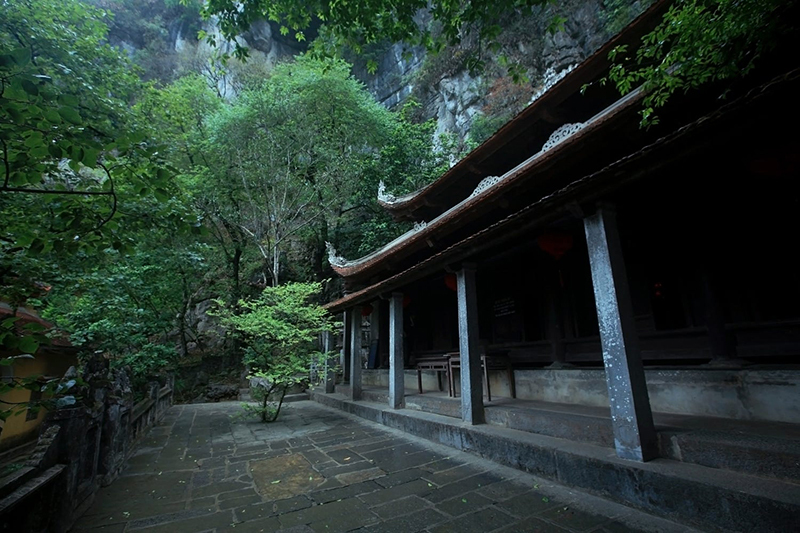 Trang An complex is a World Natural Heritage site and includes Tam Coc-Bich Dong - a series of karst caves and mountain pagodas, the ancient and new Bai Dinh pagodas, and the Hoa Lu ancient capital. The area, dotted with forests, lime mountains, rivers, lakes and dams, covers 12,252 ha.